Some time ago, I’ve set out to answer a simple question: When it comes to inexpensive Android tablets, how low can you go? What sort of tablet can I get for less than $100? To answer that question, I got the Coby Kyros, a 7-inch tablet that currently sells on Amazon for around $70. I’ve taken it through its paces, and I’m here to report on what can a sub-$100 tablet do, and what it can’t. We’re also giving this review unit away so read on to find out how you can be in the running to win this Android tablet for free! The Coby Kyros features a 1 GHz processor of unknown make (really – that’s what the Amazon spec sheet says). It has 256MB of RAM, and 4GB of storage. It features Wi-Fi connectivity, and has no 3G module. The best-known 7″ Android tablet is none other than the Kindle Fire Kindle Fire Review and Giveaway Kindle Fire Review and Giveaway It’s a brand new year, and I am proud to be part of something brand new here at MakeUseOf: An independent hardware review followed by a giveaway. Today we’ll be giving away an Amazon Kindle... Read More . Just like the Kyros, the Fire does not have built-in 3G connectivity. At 14.6 ounces, the Fire is significantly heavier than the Kyros, which weighs in at a light 11.3 ounces. All of these specifications don’t take into account one huge difference, which you would miss even if you read every word on the Kyros sales page: The Coby Kyros uses a resistive touch screen. If you’ve ever used an old Windows CE phone, you know what that’s like: One of those screens you have to push really hard with your finger to get it to do anything. Swiping across the screen involves pressing really hard, and then dragging your finger while keeping the pressure on. This is a glaring omission in the product page, and frankly, and had I known in advance that the Kyros features a resistive touchscreen, I would probably not have gotten it for review. Rather than charge via USB, the Kyros uses a dedicated charger with its own DC-in connector. The power brick is small, and looks a bit like an old Nokia cellphone charger. It accepts 110-220V, but comes with an American/Canadian prong and does not include other power connectors. A USB OTG (On-The-Go) cable, also known as a “USB host” cable. This cable connects to the Kyros’s USB jack on one end, and to a regular USB keyboard or mouse on the other end. I’ve tested it by connecting a keyboard to the Kyros, and it worked very well (more on that in a moment). The Kyros features four hardware buttons, a power connector, a mini-USB plug, microphone and headphone jacks, and a memory card slot for extending the amount of storage space available. It is a clean design, and does not attempt to be flashy. It features a relatively wide bezel, which makes it easy to grip with one hand without accidentally touching the screen. It is not a top-of-the-line panel, but it is perfectly usable for watching videos and reading Web pages. The Kyros ships with the Aldiko eBook reader app, which is an excellent use for the device: When reading an eBook, you don’t need to interact with the screen much, and there’s no need for a fast processor. The only drawback in this case is the Kyros’s somewhat short battery life, but for daily use around the house, it shouldn’t pose much of a problem. Just like how you can use the Kyros for reading, another great use is for writing: I used the bundled USB OTG cable to connect a regular Logitech USB keyboard, and it worked very well. The tablet was not super-responsive and there was a noticeable lag between my typing and the moment letters appeared on-screen, but it was still perfectly usable. As you can see in the screenshot above, the on-screen keyboard still shows up when you connect an external keyboard, but this is standard Android behavior. The Kyros also ships with Android’s stock Music app, so you can listen to MP3s using its built-in speakers or headphones. The speakers are usable, and are at about the same level of quality as the entire tablet (i.e, not stellar, but generally okay). While its processor is no powerhouse, I was able to play an MP3 while doing other work on the device without any noticeable stuttering. Unlike the Kindle Fire, the Kyros includes hardware volume buttons which make it easy to control the music no matter which app you’re in. It also features on-screen volume buttons on the Android notification bar, just in case. Google Play is not bundled with the Kyros, but GetJar is, and it’s pretty much your only option if you want to install any third-party applications. Another notable omission is the Android YouTube app: There’s a homescreen shortcut that says “Watch Videos” but it just runs the built-in Android Web browser and loads up YouTube. The YouTube video I tried played smoothly, even in the browser. The Kyros costs about half as much as the Kindle Fire, but doesn’t provide half the functionality. Its short battery life makes it impractical as a tablet for toting around town, unless you also want to bring along the compact power plug and hunt for an outlet as soon as the battery starts draining. But other than the battery, its biggest drawback in daily use is the resistive touchscreen: It makes the Kyros impossible to use with most games requiring any sort of speed or responsiveness. You could still play Sudoku on it, but that’s about it. On the plus side, the Kyros is easy to hold and doesn’t weigh much. If I had the Kyros to keep, I think I would end up using it as a distraction-free typewriter: I would just install an application like Writer, plug in an external keyboard, and write from anywhere. This doesn’t require any interaction with the screen, and the tablet doesn’t have to be super-responsive. This is a rare case in which I’d have to advise against buying this product. If you gave it to me for free, sure, I would find an interesting use for it – but I would not advise spending your money on it. If you have around $80 to spend, I would advise you to save up a bit more and go for a Kindle Fire. Then again, if you are just curious to find out what it’s like to use this inexpensive tablet for simple daily tasks, participate in our giveaway below! How do I win the Coby Kyros? The giveaway is over. Congratulations to the winner, Pierre Brienne! Tina, you would have received an email from jackson@makeuseof.com. Please get in touch with him before Aug 6. Enquires beyond this date will not be entertained. This giveaway begins now and ends Friday, August 3rd. The winners will be selected at random and informed via email. I bought a coby tablet and have had problems with it. First let me tell you about trying to charge it, it only got hot where the battery was. Charging did not happen. Then it refuses to come on. Next i have not had any luck in playing on it because it won't charge! I traded my first one in and got another one and it is doing the same thing!!!!! I am a very unhappy customer!!!!!!!!!!!!!!!!!!!!!!!!!!!!!!!!!!!!!!!!!!!!!!!!!!!!!!!!!!!!!!!!!!!!!!!!!!!!!!!!!!!!!!!! I am still going to have to pay for a machine that WON'T WORK!!!!!!!!!!!!!!!!!!!!!!!!!!!!!!!!!!!!! For a low-end tablet, this is good enough. It will become a very fine tablet if it is given for free! Even with the resistive screen and short battery life, it's not bad. I would love to win this. thanks but id rather spend my remaining points on a better giveaway. like another kindle fire? ^_^ hmmmm? Might be a bit slow, plus it's has that pressure screen, not a big fan of that. Thank you Erez for this review - in the future, don't be so apologetic about _not_ recommending a product for purchase. I wish more reviewers were that direct and honest, but too often they seem to think they owe the company a positive review in exchange for getting a test unit from them. If i have this, then I don't have carry heavy books for reading again. is cheap but think I would just by a ebook reader for the price. a friends of mine has let me use his for awhile to test it out of how i feel about them and i love them .i would like to have one of these . it would be great . I remember a classmate of mine in college had one. She said it was nothing but a headache for her when I asked about it. Told me to save up for a Kindle Fire. Must say I prefer my Samsung Galaxy TAB 7.7 over this one. It looks cool and seems very convenient for traveling. I'd like to have one for a long driving trip. I would use this around the house. I love to cook, so I could use it to display recipes in the kitchen and not worry about accidents around the device. This is the one that I have waited for and wanted. I can use it while traveling and waiting......it seems that we always have to hurry up and wait and wait. I need one. very nice ........... i want it anyway. I need a tablet, I am tabletless. I've always wanted a tablet, no matter how cheap! I have been referred to as Mr. Analog. I think this is state of the art technology for me. I might as well enter and NOT win this. Appreciated your article, after reading it I know for certain that this is not for me. Remember that if it is not something you NEED or WANT, FREE doesn't make it better. I probably would not go out and buy this, but I could definitely find a use for it. I'm not so sure that i like the pen idea. Honestly, it doesn't sound that useful. I'd rather get a higher-end tablet used. The limited battery life is a definite minus here, as is the resistive screen. Not entering this one, but thanks for reviewing it for us! would be great for my first tablet, for beginers it would do just fine. I would add that the resistive screen is like the old Palm devices of old which are better known than your comparison. Before I would ever pick up an Android device my first question is always how easy is it to add custom ROMs. This is because every stock Android device I have ever used had issues. However custom ROMs like CyanogenMod fix most if not all those issues and just make the device better. I would advise everyone to check out the XDA developers forums to see just how tweakable an Android device is ahead of time. Enjoy. At least we don't have to bring one heavy duty laptop just to view documents over a short meeting or even reviewing notes in school! I want this thing! Good luck all, I don't need this, already have a couple tablets. Would still be great for my son. He'd love to have a techie device and I'd love for him to be reading ebooks. This would be perfect for e-book reading, even with the three hour battery life. Mabye $25 would be a better price. I saw one at ollie's the other day. And as usual for around $70 dollars read almost equal to $100 dollars in pounds here in UK. A long way to go yet for affordable tablets. Tanks for this giveaway.. hope I'll win..
the best break through in ICT, I like it. this coby kyros tablet is so fantastic and I believe it is the greatest break through in IT world, I like it. I have one of these tablets and it does a pretty good job, the two biggest drawbacks that I have found, is the short battery life and you can not download from the google play store. They don't recognize it. Also I can't connect to Getjar. It starts to connect and then just sits there at about 80% so I seem to be limited to Amazon's app store. it would be great to have one like this. Its awesome & amazing but r u really sincere about dis giveaway of a thing...! Cos ever since dat i had been tryin nothing gud comes out of it...! Hmm dis is my last effort kindly stop dis fake PROMO...! Wonderful gadget for my reading needs. Excellent review. Count me in please. This website is very important to every one and I always like to view its contain in every mail that I receive properly. In the mean time I have open a folder under the name of MAKE USE OF especially to save the daily mail that receive from this site. In the past, present and even in the future they will surely help me a lot. Well, I sure would like this little big gadget for myself. I cannot afford the IPAD, Kindle etc. I need this to teach my grandchild to read. For me it is better than a laptop. I love to read, but my eyes are tiring very easy. This would be great for me, my family. Thank you for a great chance to enter. I appreciate the great technology you choose on your site. Infos, help etc. Thank you again. Neat! I want a Kindle, but this is still a tablet; sub-quality or not, I'm sure it would come in handy to have! Maybe I could finally upgrade from Win 98? This is amazing . I wish i win this . I would love to have this .... I wish . This is a great giveaway. I really enjoyed the review. Sounds like the Coby Kyros does more than I ever expected. Great review. I think it would be great for those whom could not afford a Fire or Nexus. Good i want it for my son. I like it, i want it, i need it! This would be cool, I'm not in the right century with my technology yet. Nice product.I hope I win one!! using my points for entries.This would be an awesome gift for my husband.following and sharing. this is not meeting my requirements. Anyway if i get this, this will become first tablet. Looks okay. Might get it. For free is not bad. Ill take it if I win. Looks like a decent device for those who cannot afford a Fire or Nexus. Good review. Not bad, I have enough tablets already so good luck everyone who is entering! Would love it. Thanks for the chance to win! A fantastic device. I'd love to give it a run! I need a tablet and if I could even get this tablet it would mean the world to me. I would LOVE to win this for my parents! Well, let's face it, Coby is known for poor quality knock-off items. I'm surprised it works as well as reviewed. Great for surfing the net and checking sports scores. Looks like a bargain at that price. It'd be fun to compare it side by side with my modified Nook Color. Well, let's face it, Coby is known for poor quality, knock-off items. I'm surprised it works as well as reviewed. Nice looking tablet. Would love to win it. Beats what I have now (nothing). Interesting and helpful review. Thank you. I'd like to see a comparison of the iPod Touch the Samsung Galaxy. Very interesting! One spectacular Tablet. I would love to have this device. Even thought I don't think that these devices are going to change the way we compute, I still believe that these devices will make our lives more interesting for sure. Good way to introduce students to a tablet interface. While I can appreciate needing to post to Facebook or other social medica accounts or make a comment, the MakeUseOf site needs a sign-in button, etc. I think this would be great as a no-frills tablet that you wouldn't be terribly upset about if it were broken or stolen. this corby would be a great addition to my gadget collection... mabuhay to all! Short battery tablet is of no use. that is what I like about iPad: 10 hour independence. Good way to introduce students to a tablet interface. I think that 80$ it's not too much. The mistake is to compare it with the kindle fire that costs 199.00$ but that give you more than coby. 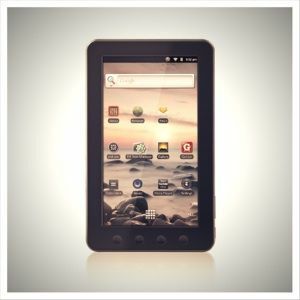 Do not forget that a tablet like the coby Kyros is something more a toy!. However I'd like to win it. Nice to see a competitively priced well featured tablet. Nice to see some decently priced competition. The big boys have been making a killing. More devices are needed to up the quality and reduce the price. very nice, i would like to have 1 !!! Hmmm, at first I was so surprised that there is a $70 tablet on the market. I mentally compared that to one of those earlier generation ipod Nanos back when it had video. Ok, so this tablet is just 7"; quite impressive just due to the parts costs. But then the review reveals just a 3hr battery, and a resistive rather than capacitive screen (so that you must press hard or use a stylus to operate the device), and the old phrase "you get what you pay for" comes to mind. So I agree with the reviewer that most people should pass this one by when looking to make a purchase. But if one falls in my lap I would make some use of it, probably to read some Kindle books or charge it up to watch one movie on the go. It would also provide a method to explore the Android app market. Apple, you have nothing to be concerned about with this product. They are pretty nice for the price. The resistive screen and low memory do hurt the unit a scosche, but for the price, you can't really beat it. I mean, if you use this as a primary, it wouldn't be enough power. Love this 7 inch device! Would be a nice way to get started on this website and share you with my readers. Wow! Won't my web life be enhanced with this here fancy device? Wow, won't my web experience be enriched with this here fancy device? I like the physical size of it. It's compact and easy to carry around. Very nice for an inexpensive android tablet. Agree, it's not impressive nor a MUST have but for the price you can give it to one of your kids..
so cool and awesome. wish i could have one! Thanks to MakeUseOf for another great giveaway!! Keep em comming. I have entered and shared. I would love me one of this!! As a first Tablet and my insane curiosity of them, this sounds like an ideal starter. Where I would use it the most is within the home so the plug in charger doesn't bother me. This would be ideal to carry around the home, listen to music wherever I am and an indicator as to whether investing in a Tablet would be worth doing. It would be fun! shure, you can't expect much of those low-budget devices, but IMHO there are better ones available in this price segment. Though, when looking for the specs I found the successor, among others having a capacitive touchscreen, for just a few $$$ more. Perhaps that'll be worth a trial? Not great but equal to what you pay for. Modest tablet though. I need a tablet and this has provided me with a chance to win it! Thank you! I bought a Cobu Kyros tablet from amazon.com and was completely dissatisfied with it. I returned it within days of recieving it. Contrary to Mr.Zuckerman,I wouldnt even want one as a gift! Indeed,use your money for something usefull. Or if you really want to throw away $80.,throw it my way! Yup, The Recommendation is rather correct i.e. not to buy it. One of my Relatives has this and when I was just experimenting with it. I found it hard to use. Especially the Touch experience is really bad. The OS is not updated and it has some bugs like you cannot input a SIM card into it but it will ask you sometimes. I always love free gadgets. MakeUseOf is my first choice. I really like MakeUseOf. It is very similar to Micromax funbook which is available in India, but that comes with a capacitive touch screen as well as 512mb ram. 256mb is just not good enough these days. After doing my own research, you might as well spend a little more for quality even if it's for your kids. The Kyros just fails in every aspect and I will graciously accept if I get picked. Not really the tablet I want but if its free I guess I'll take it, if only for emails and web surfing. A good E-reader for my kids. Plus they are used to the resistive touch screens on their NIntendo DS. This is not the tablet I'm looking for, but it's ok for free. My dad has one of these and it drove me crazy just trying to download apps to it. I guess for the cost it's worth a try for some but the experience was very disappointing and frustrating for me. My dad finally gave up on it also, not efficient enough to merely use for email and browsing for him. Yes, I would add this to my Kindle, Samsung Tab, IPOD, BB, Laptop gizmos. I am always working (or should I say playing) on one of them. I would love to win this and brag to all my buddies with a nexus 7. BooYeah! What Kind of processor is in your Nexus? Duh....What processor is in my Kyros????? You wish you knew.. Its confidential. Its so rare Amazon doesn't even list it. But.....Let's just say it's the official tablet of the Illuminati...BOoYEah! I'd rather save my money for a Nexus 7. I've tried a few of these and, for the price, they can be handy. It all depends on what you intend to use it for. Gaming....not so much. Reference to a cooking recipe that you can keep up while you're cooking, very much so. So It's basicly cheap e-book reader with bad battery but with more functional OS. Hmm. Not rich enough to buy cheap things, I'd say. I have a cheap tablet already. They are good for reading and some games. But surfing is a bummer. Allison hit the problem with browsing on the head. It is a piece of technology. You have to find a situation to apply it optimally. Good one. I want this! It's affordable device to buy, count me in. Its affordable device to buy. I'm in. Hey, if it's free... why not? Would be ideal for a child to use (instead of spending a load of money). It's a $70 tablet. I repeat; It's a $70 tablet. Understand what that means in relation to other tablets and you can decide if it's for you. Read the review to find out the good/bad/ugly, and that'll give you the lowdown. I'm using a Google Nexus 7 which whips serious you-know-what, but that goes for around $275 (including shipping). You pay for what you get. $70 is a lot of money for some people. Yet you are right, you get what you pay for. Nope, I would rather go for a Capacitive touch device. I got a 8Gb 1.2Ghz with 1gb RAM with capacitive screen for $65, direct from the supplier I would have shied away from the resistive screen. My daughter would love to have this. She is constatnly using the one I won for working Christmas eve. I want to win it - if not, I could buy it. Only $70. Just for video playback and text reading. this tablet would be waste of money IMO. you might buy it now but after a month, the resistive touchscreen will make you go crazy, if it had been capacitive, it would've been great VFM. Other than this, i think you are wrong on one point. "I would advise you to save up a bit more and go for a Kindle Fire"
The resistive touchscreen is not that bad considering I have used on for over 6 months now. i think you are wrong on one point. wow thanks for the info, had no idea about surface. The integrated keyboard looks great. Said that, i would still prefer nexus 7, coz its more fun. win 8 tablet seems quite feature rich but i really have low hopes from windows 8. It might become a netbook alternative in future but IMO it wont be able to get much market share in tablet segment, maybe 1-2% at max. I think tablets with androids are better as the play store is way more app filled than windows store ever might be. I would agree. I have a Nexus 7 and it's great -- hardware is much better than a Kindle Fire. I'm also outside the US, so I can actually purchase and use a Nexus 7! But is it worth the trick trouble to enter the competition ? The tablet is great for traveling. Me TOO. If it does'nt work properly, I will take it apart and use it's components for other purposes. LCD touch screens alone of this size retail for much higher prices. @vu=ineedcool same here! way cool! so good luck friends I'm out of the give away contest...............!!!!!!!!!!! !